Here’s my second post from the Booklounge Insiders’ Blog about the Ottawa International Writers Festival. I had a wonderful day at the Ottawa International Writers Festival on Sunday. At 2:00 p.m., Sarah Dearing chaired our panel on Canadian literature. Bill Gaston started things off with a wonderful reading from his new novel, The Order of Good Cheer. I read next. The crowd was very kind and laughed in all the right places. Then Stephen Henighan read from his book of essays, The Afterlife of Culture. With all four of us on the stage, Sarah Dearing posed questions to drive a discussion on the state and future of our literary culture. I was a little intimidated by the topic but the discussion flowed with several questions from the floor as well. After 90 minutes (that seemed more like a half hour), we moved to the foyer to sign our books. After our session, literary comet Joseph Boyden, hot off of his Giller shortlisting, read from his new novel Through Black Spruce, to a packed house. CBC radio personality Laurence Wall adroitly moderated the session. Beyond the moving reading and insightful discussion, the highlight of the session had to be Joseph Boyden performing three different moose calls (I kid you not!). The line up at Boyden’s signing table after the session snaked around the foyer and almost certainly left him with a swollen pen hand. The final session I attended brought together three amazing writers for a reading and discussion. South African Booker nominee Damon Galgut read from The Imposter, Amitav Ghosh read from his Booker nominated novel, Sea of Poppies, and then Kenneth J. Harvey read from his epic masterwork Blackstrap Hawco. What a thrill to hear these three celebrated authors. I spent the evening choosing my selections for a reading I’m doing at the Ottawa Public Library tomorrow (Monday) and sifting through some great memories of a wonderful OIWF weekend. Click here for a great photo shot by John MacDonald, an Ottawa-based freelance shooter who also writes. I wrote this blog post for the Booklounge.ca Insiders’ Blog and thought I might as well cross-post it here. 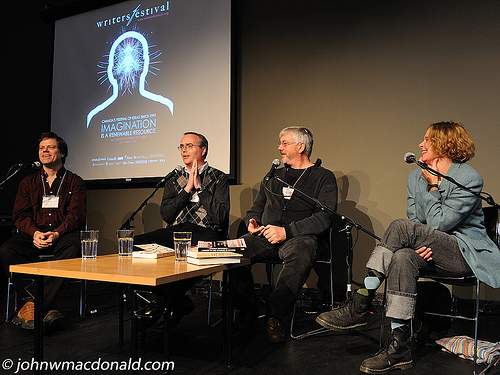 Appearing at readings and writers’ festivals is still a new and wondrous experience for me, as is bearing the surreal label of “writer.” If you’d have told me six months ago that this past weekend I’d be reading and on a panel, as a “writer”, at the Ottawa International Writers Festival, I’d have suggested reassessing your medication. Yet here I am.